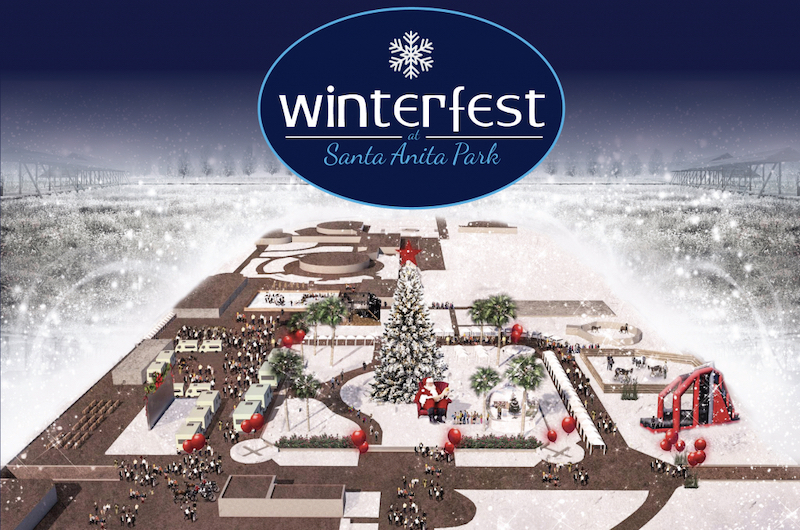 Winterfest at Santa Anita Park will kick start the holiday season in style. This family friendley event includes a visit from Santa Claus, horse drawn carriage rides, a Santa’s Village and petting zoo, carolers, seasonal foods, a 80+ vendor Odd Market and other Christmas themed activities. General Admission cost $5. Kids 3 and under are free. Three special packages are available for Winterfest. They include a Winterfest Starter Pack for $35 that provides admission, ice skate session with rentals, 14 inflatable and ride tickets. The Kid Winterfest Ultimate Pack (valid for kids 3-13 years old) cost $60 and includes admission, ice skating, unlimited wristband for inflatable and rides, picture with Santa Claus plus one print, access to the petting zoo, a pony ride and a carriage ride (must be accompanied by an adult.) For grownups who want to expereince the festival, opt for the Adult Winterfest Ultimate Pack. It cost $65 and includes everything mentioned in the Kids Winterfest Ultimate Pack sans a photo with Santa but instead tack on a specialty winter cocktail. All packages can be found at a discounted rate via Godtstar while supplies last. There will be free general parking through Gate 6 (Infield Entrance) off of Colorado Place. Winterfest is open Thursdays through Sunday from November 23 through December 23. Hours for Winterfest are below. Thursdays: 3 – 10 p.m.
Fridays: 3 – 10 p.m.
Saturdays: 11 a.m. – 10 p.m.
Sundays: 11 a.m. – 8 p.m.
Additional information can be found in the link below.